Nele Hertling, born in Berlin, studied Philosophy, German Language and Literature, and Theatre Studies at the Humboldt University of Berlin. She freelanced with broadcasting stations and publishing houses. From 1963 Nele Hertling worked as a research assistant in the music and performing arts department at the Academy of Arts in Berlin. 1986-1988 she was director of “Werkstatt Berlin”, when Berlin, in 1988 was European Capital of Culture. 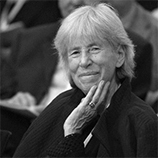 In 1989 she initiated the Hebbel-Theatre in Berlin and directed it until 2002. From 2002 until the end of 2006 she directed the “Berliner Künstlerprogramm des DAAD”. Since 2006 Nele Hertling is vice president of the Academy of Arts in Berlin. She is a member of several committees and cultural initiatives, amongst other things spokesperson of “A Soul For Europe”.